Severe degradation of water quality from nutrient pollutants has increased eutrophication that affects aquatic ecosystems and increases the cost of water treatment. This study was conducted in the Sengari Reservoir basin, which experiences high eutrophication due to phosphorus in the nutrient load it receives. Dissolved phosphate–phosphorus (PO4–P) accounts for the highest ratio of total phosphorus flowing into the reservoir. The aim of this study was to quantitatively investigate the PO4–P load emitted from different land uses in the basin. 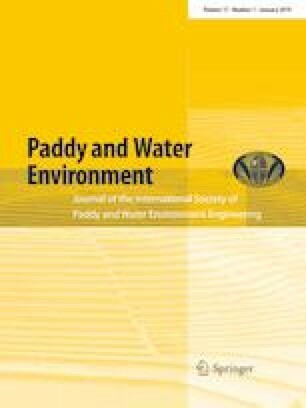 Water was sampled at regular intervals and analyzed to understand the temporal and spatial changes in PO4–P concentration in the basin’s rivers. Linear regression water-quality predictive models were thereafter constructed. A comparison was made between the irrigation and non-irrigation periods, and sub-basins with septic tanks and those with rural sewage treatment plants. Results from linear regression models indicated that paddy fields and residential areas had the highest coefficients compared to forests and golf courses. The irrigation period had a high PO4–P concentration compared to the non-irrigation period. Sub-basins with septic tanks had a high PO4–P compared to those with rural sewage treatment plants. Effectively managing water quality in the Sengari Reservoir to reduce eutrophication depends on significantly reducing the nutrients in agricultural areas, particularly during the irrigation period, and adequately treating water before discharging it into the rivers. The models provided a helpful tool for conducting a non-point source phosphorous investigation in the Sengari Reservoir to prevent excessive pollution from nutrient load. The authors express their sincere gratitude to the Water Quality Examination Laboratory, Kobe City Water Works Bureau, for the provision of data. This study was supported by JSPS KAKENHI Grant Number 16K15007.